The answer is simple. 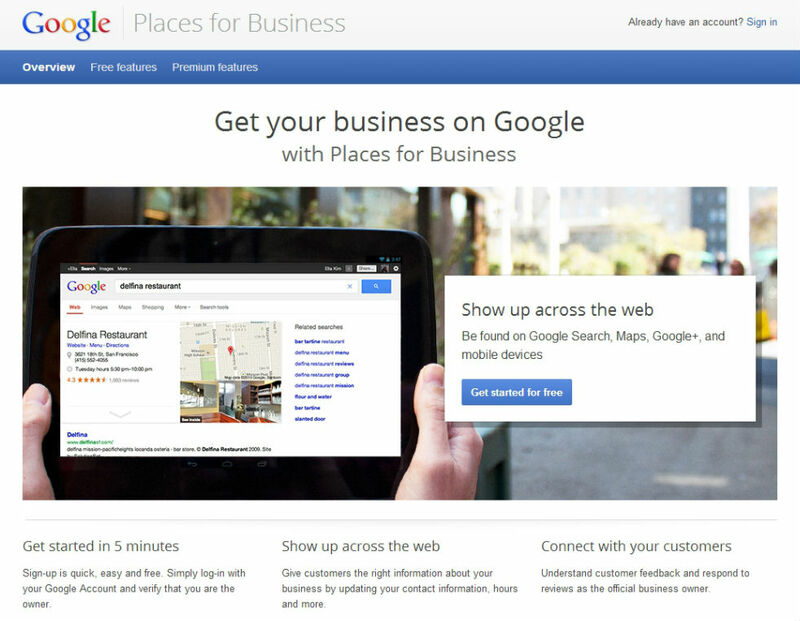 To gain more exposure in search results on Google Search, Maps, Google+ and on mobile devices. This not only applies to those that have a brick and mortar store. It is also helpful for those who run an online business. Think about it. Consumers these days use Google to search for products, services and local businesses with their smartphones, tablets or laptops. By providing all the relevant business information when you sign up with Google Places, it helps Google offer a better and more accurate search result to consumers who are looking for specific categories of products and location. Setting up an account is easy and straightforward. If you already have an AdWords or Gmail account, you may use those to sign in. Consider which Google account to use because you may want to share this account with others in your business next time. Once logged in, enter your business’ main phone number and country to see if Google Maps has any information about your business. Chances are your business may already be listed but the information is either inaccurate or not complete. You’ll then be able to edit any existing information and add new details, including photos and videos. Please add in relevant and interesting details about your business that visitors will find engaging and informative. Google will require verification to ensure that the information and account is legit. The verification process will come in the form of a phone call or sms to a phone number or they may even send you a postcard with the verification code on it. Once completed, your business will then be listed by Google. Email account : Preferable to use one under your business domain, sharable for easier updating. Bearing in mind that Google if given a choice between two similar places listing will opt to display the one with the more complete information. So don’t only fill up the compulsory fields but also the optional ones. Remember to include your website URL, email address, phone number, opening hours, types of payment acceptance along with a proper description of your business. You’ll have to enter in your business category (the ones Google recognizes). Google provides up to 5 categories so choose the closest and most accurate that describes your business. If you need some help, you can check out this site by Mike Blumenthal (http://blumenthals.com/index.php?Google_LBC_Categories) who basically has a database of what categories Google uses. Just select the country and language from the drop down list that’s applicable to you. To see all of Google categories, select a country and language but leave the search field blank. Once you’ve got everything set up, you’ll want to integrate with Google+ so that the social sharing side will help complement your Google Places listing. If you haven’t set up a Google Plus account yet, please do so with your existing Google email. Set up your cover page as using Google+ will allow you to post out news, reviews and interact with customers. Try it out and start getting listed. Are You Making Full Use Of Google For Your Business? Is Your Facebook Getting Really Boring? Tired Of Shopping Cart Abandonement By Shoppers?